Wednesday was sunny and clear, so I took a few minutes to get pictures of the house from the outside, along with the rest of the grounds. You’ll find the tour here. After a talk describing the thesis of her book The Overworked American, an upper middle class woman (hospital administrator) asked Juliet Schor about the work and spend cycle—or, to be more specific, she acknowledged that she was deeply caught within it and asked how it was possible to break out of it. As she tried to respond to the question, Schor realized that an adequate answer required a much deeper understanding of the drive to spend. She set about studying the matter, and wrote up her results in her book The Overspent American, published in 1998. This is an important book, not so much for the analysis it presents but because it makes an honest attempt to understand a pervasive, deep seated, and highly corrosive aspect of modern life: we are driven to spend far beyond our means, and catering to that impulse seems to further inflame it. Most people who take note of this tendency explain it away with pat observations about basic human nature—we are greedy, or we are competetive status-seekers, or contentment does not come to us naturally. Schor’s book shows that not only can one delve much deeper into the matter, but that a significant cultural change has taken place in the past hundred years which makes our modern-day acquisitiveness a new and different thing. Even though I think this is an important book, I can only recommend it if you have an ongoing interest in the subject; if you read only this book, you will probably come away more puzzled than ever. But if you read it together with books about advertising and marketing and consumer credit and globalization, it will provide some important pieces for a puzzle that you will have to assemble for yourself. It can also serve as a gentle introduction to books that I think probe more deeply but are also in starker opposition to conventional wisdom, such as Naomi Klein’s No Logo or Stuart Ewen’s All Consuming Images. For those who aren’t likely to read the book, here is my favorite insight. Schor notes that conspicuous consumption has long been with us, in the sense that people use the things they own to visibly demonstrate their status. Until very recently, though, the competition was limited to people of roughly the same economic class. Television and other mass media changed this by bombarding the audience with images taken from the highest economic strata, with the result that people were no longer trying to keep up with the Jones down the street, but with the beautiful and wealthy creatures they saw on TV and in movies and magazines. Everyone is now competing with an ideal that is far above them economically. Schor also conducted an interesting study to help determine whether luxury items were valued more for their (supposed) intrinsic benefits or for their implied status, involving women’s cosmetics. She found that women were much more likely to buy an inexpensive brand when the product was something that she wouldn’t use publicly, such as facial cleanser. The idea for the study came when she noticed that friends and colleagues would pull out lipsticks after a meal, and out of curiosity she would ask each person if they recognized the brands of the other lipsticks being used, even from a quick glance across the table. Recognition was very high. After more probing, she learned that it was quite common for women to carry two lipsticks, an inexpensive drugstore version to use in private and an expensive brand which was only employed in public. One way I’ve tracked the state of American society over my years as a reader is to revisit books that made a splash when they first appeared. Mostly it’s a depressing exercise. A book comes along that offers a perceptive critique of this or that aspect of the culture, and soon enough the chattering classes are abuzz with observations on the subject. The problem is dissected and moaned over, and then promising new approaches are identified and mooned over. But after a few months interest in the problem is displaced by the next perceptive critique. Revisit the whole matter after ten or fifteen years and you find that the problem exists unchanged, or perhaps changed by events and circumstances that completely escaped our diagnostic efforts at the time; meanwhile, the promising new approaches turn out to have been stillborn, or to have faded away after the initial splash, or (all too often) to have been used as an opportunity for a few “experts” to build a career writing books and giving talks about the promise of the approach. It’s all a shame, because quite often we miss the value that could have been gotten from a less ambitious, more patient, humbler take on the matter. If instead of taking these critiques as presenting a problem to be solved (a take usually encouraged by the writer), we took them simply as discussions of difficulties whose sources should be sought out and pondered, we might end up accumulating some wisdom in the process. As an example, take the matter of the American habit of working to exhaustion for the sake of material gain. This was a hot topic twenty years ago. One of the best-known (and best) works on the topic was Juliet Schor’s book The Overworked American: The Unexpected Decline of Leisure; I don’t remember if it was the book that actually sparked the national discussion, but it was certainly emblematic of it. And some of Schor’s observations live on in the national consciousness, e.g. the fact that Americans spend many more hours at work than their counterparts in other affluent Western countries. But do we really remember what Schor had to say about how we got into this mess, or the reasons why it actually does constitute a mess, or the promising new approaches that might get us out of the mess? More likely we have a vague feeling that people in the know have looked at the problem, fixed it as best they could, and whatever remains of the problem (in this case, all of it and more) is simply intractable. But if we if had set aside our impulse to cut to the chase, and instead taken our time to fully understand Schor’s account of the situation, we could have come away from the discussion with a bit of wisdom that could be applied to much more than this specific subject. And that bit of wisdom is staring us in the face, right there in the book’s subtitle, The Unexpected Decline of Leisure. What? The ongoing decline in leisure was unexpected? We somehow expected that leisure would not decline, that it would at least stay constant and perhaps increase? Well, yes. And most of us should have at least a vague memory that this was one of the promises of modern living, that technology would provide us with labor-saving devices that would free up time previously devoted to labor, that could then be devoted to leisure. Perhaps accompanied by a vague puzzlement about why we have more such devices than ever, but are also working more hours than ever. Americans really are working longer hours, not by choice but out of necessity. Before the advent of wage labor, the average person invested about half as much time in providing for their needs. When wage labor became widespread, employers found that once their basic needs were covered workers were prone to choose leisure over further pay for further work. Employers would much prefer to have fewer workers working longer hours than more workers putting in fewer hours. In the beginning a primary goal of unions was to obtain shorter working weeks for their members. To increase his work force by one hundred, Henry Ford had to hire one thousand new workers, 90% of whom would quit rather than endure the conditions. This changed only when the culture changed and laborers began to live larger, requiring more disposable income, making them dependent on keeping a wage-paying job. Labor saved by new devices in the home was more than offset by a corresponding change in standards of living—more frequent housecleaning (and more stuff to be cleaned and maintained), changing clothes daily, fancier meals. Consumer credit did more than anything else to establish a cycle of work-and-spend, where spending increases the need for paid hours, which leads to further spending as a compensation for circumstances made increasingly miserable by work. Schor ends her book with the usual account of promising new approaches to addressing the problems she has identified. I realize that such optimism is de rigeur. Some of the writers I admire most, such as Jacques Ellul, are regularly dismissed because they offer analysis and criticisms without proposing solutions. After three exceptional books analyzing various ills of modern society, Neil Postman announced that he would no longer do so, finding it too depressing, and would from then on write only on subjects where he had positive proposals to make. But it is exactly this demand on the part of readers that diminishes the value of the resulting book. It is tempting, and too easy, to breeze through the early chapters of The Overworked American, come away only with the idea that we work too hard, and then be comforted in the end by the knowledge that forward-thinking people are on the case. Instead, I think we ought to be astonished at how much of Schor’s historical account is at odds with conventional wisdom, and then start looking at how radically our own thinking needs to be adjusted so as to be consistent with it. In the end it is clear thinking, rather than some poorly understood off-the-shelf approach, that will help an individual negotiate the maze of his own life. Yesterday I happened to be on an all-day drive, so I listened to a lot of NPR, and heard parts two and three of their series on how the bail system in American courts is broken. I didn’t care much for the human-interest style of journalism—the point could have been made far more effectively in one-third the time—but they focused on an excellent example of how systems are almost guarantee to break if people stand to make money from their workings. The current system is costing cities and counties huge amounts of money (one-quarter of the budget in many cases) and imposing a huge financial hardship on people with scant resources, all for questionable results. Meanwhile, there is an alternative (pre-trial release with electronic monitoring) which costs about one percent what it costs to hold someone for trial—and allows them to continue living their lives, and earning money—but is being derailed by folks who lose money when it is used. Most of the forty minutes it would take to listen to these stories would be wasted, but fortunately the NPR website has transcripts which can be read through much more quickly. I’ve mentioned Elmo Stoll once before on this weblog. And I remember being helped in my understanding of community by an article he wrote. Today I ran across a three-part blog posting by Ira Wagler which is an extensive recounting of Stoll’s life and work. I can’t recommend this piece highly enough to anyone interested in the possibilities and pitfalls of Christian community. Note, though, that it is very long. I suggest that you cut and past it into something like Microsoft Word; when I did that, the document ended up thirty pages long. But it is some of the most riveting writing I’ve read in a long time. This afternoon I was looking at the website of the Acoustic Coffeehouse in Johnson City, Tennessee, a venue that the Possum Playboys will be playing next month. Specifically, I wanted a look at the room where performances are held. Chris and I actually played there once, many years ago; at the time (and maybe even now) they had a perpetual open mike policy, where anyone was welcome to play if there wasn’t already a scheduled event. We wandered in a couple of times around three in the afternoon and played for an hour, to a mostly empty room. Later we were part of a weekly old-time jam session held there that ran for a few months. What I remember about the room was that it is small, a concern for a band that has four or five members and carries lots and lots of instruments. And I was hoping I could see if anything had changed in five years, without having to travel there in person. So I was glad to find that the owners have shot many, many videos of groups performing there, which they’ve posted to YouTube. I looked at the embedded pictures on the home page, and found one of a group with five members, so I gave that a viewing. It didn’t actually give me much idea of how the Possum Playboys would manage the space. But these guys were hot! Turns out it was the Carpenter Ants, a foursome (the fifth guy was a guest fiddler) from West Virginia that has been playing for about twenty years, in a configuration Chris and I are very interested in right now—electric guitar, bass, and sparse drum kit. The drummer usually plays a kit with a bass drum, hi hat, and snare, but that night at the Acoustic Coffeehouse he was playing only a snare (no doubt because of the tight quarters), and so their performance is a good example of how the simplest of drum setups (and drumming) can really drive a group in certain ways. Here’s my favorite video, a gospel song called “I John saw”. Below I’ve placed links to two other good ones, “Picnic With the Lord” and “Pray On My Child.” The sound is OK, but the image is fantastic—must have been filmed in high resolution—and I recommend viewing these videos in full screen mode if you can. We love chorizo sausage, at least the Mexican variant. We might also love the Spanish original, but we have never tried it. Mexican chorizo is very mushy, and as far as I know is meant to be fried like ground meat, resulting in little bits of sausage swimming in a sea of red grease. Drain as much of the grease as you like, then use the rest as an addition to taco meat or—our chosen means of ingesting it—scrambled with eggs which are then eaten with flour tortillas. 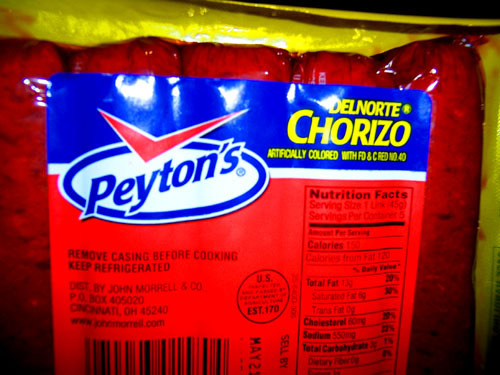 The local Wal-Mart carries a couple of brands of chorizo, but neither of them has the flavor or spicy kick of Peyton’s brand chorizo, which can be hard to find even in the southwest. My sister in San Antonio has to buy hers on trips home to El Paso. When Chris and I were in El Paso for my dad’s eightieth birthday, he remembered our love of chorizo and bought a bunch of it for us to take home with us. Debbie is just now frying up the first pack since then—our egg eating has been severely curtailed by our hungry but currently unproductive laying hens—and it smells wonderful. But I heard some noises of dismay, and when I went in to see what was wrong she pointed at the ingredient list, which reads as follows, and I do not joke: beef salivary glands, lymph nodes and fat (cheek/tongue), beef tripe, beef, flavoring, cereal (wheat, rice, oat, rye flour), water, salt, dextrose, sodium nitrite, FD & C red no. 40. Wow, talking about using the whole cow! She also pointed out something that is at least good for a laugh, although I don’t think it actually helps us here in chorizo-sparse Kentucky: Peyton’s is distributed by John Morrell & Co. out of Cincinnati, a few hours up the road.